VGTU was the first university in Lithuania who started working with High Performance Computing. IBM SP was installed in 1998. The Laboratory of Parallel Computing was founded in 2000. The Beowulf cluster was built in 2002. The Lithuanian record of the best parallel performance on cluster “Vilkas” was achieved in 2005. The Laboratory of Parallel Computing started activity in grid computing at 2004 when first testbed grid based on ARC middleware was installed together with colleagues from Vilnius University and Kaunas University of Technology. Shortly after that gLite cluster was built and connected to Litgrid and BalticGrid infrastructure. In the laboratory, research activity is focused on parallel and distributed computing, grid technologies, computational methods, visualization and software engineering. Actual applications of material sciences, nano-particles, engineering, computational fluid dynamics, multi-physics and bioengineering has been solving on the computer clusters supported by personnel of the Laboratory of Parallel Computing. Laboratory of Parallel Computing comprises one of the most powerful PC cluster in Lithuania with measured HPL performance Rmax = 512.8 Gflops (96 CPU). Resources of cluster are open to all Lithuanian universities and research institutes. EGEE certified grid clusters ce.grid.vgtu.lt and ce2.grid.vgtu.lt are fully integrated in the European Grid infrastructure. ce2.grid.vgtu.lt is equipped by GPUs and targeted for visualization software. Experimental CREAM Computing Element and Cloud cluster are built for development of grid e-services. In the laboratory, research activity is focused on parallel and distributed computing, grid technologies, computational methods, visualization and software engineering. Research in the area of high-performance computers and parallel algorithms. Starikovičius, Vadimas; Čiegis, Raimondas; Bugajev, Andrej. On efficiency analysis of the OpenFOAM-based parallel solver for simulation of heat transfer in and around the electrical power cables // Informatica. Vilnius: Vilniaus universiteto Matematikos ir informatikos institutas. ISSN 0868-4952. Vol. 27, no. 1 (2016), p. 161-178. [Duomenų bazės: Science Citation Index Expanded (Web of Science); INSPEC; Scopus]; [M.kr. : 01P; 07T; 09P]; [Citav. rod. : 1,386(F) (2015)]; [Ind. : 0,333] [Ind. aut. lankais: 0,429]. Čiegis, Raimondas; Starikovičius, Vadimas; Tumanova, Natalija; Ragulskis, Minvydas. Application of distributed parallel computing for dynamic visual cryptography // The journal of supercomputing. New York: Springer Science+Business Media. ISSN 0920-8542. Vol. 72, iss. 11 (2016), p. 4204-4220. [Duomenų bazės: Science Citation Index Expanded (Web of Science); SpringerLINK; SCOPUS; INSPEC; Zentralblatt Math; EBSCO Discovery Service; CSA; Academic Search; Gale]; [M.kr. : 01P; 09P; 07T]; [Citav. rod. : 1,088(F) (2015)]; [Ind. : 0,250] [Ind. aut. lankais: 0,304]. Kačeniauskas, Arnas [Kačeniauskas, A. ]; Stupak, Eugeniuš [Stupak, E.]; Maknickas, Algirdas [Maknickas, A. ]; Starikovičius, Vadimas [Starikovičius, V.]; Pacevič, Ruslan [Pacevič, R.]; Staškūnienė, Miglė [Staškūnienė, M.]; Davidavičius, Giedrius [Davidavičius, G.]. Numerical simulation of aortic valve // Mechanika'2016 : proceedings of the 21th international scientific conference, 12-13, May, 2016, Kaunas University of Technology, Lithuania. Kaunas: Kauno technologijos universitetas, 2016. ISSN 1822-2951. p. 107-110. [Duomenų bazės: Conference Proceedings Citation Index]; [M.kr. : 09T]; [Ind. : 0,286] [Ind. aut. lankais: 0,082]. Maknickas, Algirdas; Stupak, Eugeniuš; Kačeniauskas, Arnas; Davidavičius, Giedrius; Aidietis, Audrius. Semi-analytical geometry modelling of aortic valve // 22nd Congress of the European Society of Biomechanics (ESB 2016), July 10-13, 2016, Lyon, France Lyon: European Society of Biomechanics, 2016. p. 1. [M.kr. : 09T; 06B]; [Ind. : 0,200] [Ind. aut. lankais: 0,014]. Kačeniauskas, Arnas; Starikovičius, Vadimas; Maknickas, Algirdas; Stupak, Eugeniuš; Davidavičius, Giedrius. Patient-specific simulations of aortic valve flows // The 14th international symposium on Computer Methods in Biomechanics and Biomedical Engineering (CMBBE), Tel Aviv, Israel 20-22 September, 2016 : abstract book. Tel Aviv: Tel Aviv university, 2016. p. 46. [M.kr. : 09T; 07T]; [Ind. : 0,400] [Ind. aut. lankais: 0,029]. Stupak, Eugeniuš [Stupak, E.]; Kačeniauskas, Arnas [Kačeniauskas, A. ]; Starikovičius, Vadimas [Starikovičius, V.]; Maknickas, Algirdas [Maknickas, A. ]; Pacevič, Ruslan [Pacevič, R.]; Staškūnienė, Miglė [Staškūnienė, M.]; Davidavičius, Giedrius [Davidavičius, G.]; Aidietis, Audrius [Aidietis, A.]. Computational analysis of patient-specific aortic valves // 40th International solid mechanics conference (SOLMECH 2016), 29.08-2.09 2016, Warsaw, Poland Warsaw: Polish Academy of Sciences, 2016. p. [1-2]. [M.kr. : 09T]; [Ind. : 0,125] [Ind. aut. lankais: 0,018]. Belovas, Igoris; Starikovičius, Vadimas. Parallel computing for mixed-stable modelling of large data sets // Information technology and control. Kaunas: Technologija. ISSN 1392-124X. Vol. 44, no. 2 (2015), p. 148-154. [Duomenų bazės: Science Citation Index Expanded (Web of Science); INSPEC; VINITI]; [M.kr. : 01P; 07T]; [Citav. rod. : 0,623(F) (2014)]; [Ind. : 0,500] [Ind. aut. lankais: 0,250]. Markauskas, Darius; Kačeniauskas, Arnas. The comparison of two domain repartitioning methods used for parallel discrete element computations of the hopper discharge // Advances in engineering software. Oxford, England: Civil-Comp Ltd and Elsevier Ltd. ISSN 0965-9978. Vol. 84 (2015), p. 68-76. [Duomenų bazės: Science Citation Index Expanded (Web of Science); Science Direct; INSPEC; Compendex]; [M.kr. : 07T; 09T]; [Citav. rod. : 1,402(F) (2014)]; [Ind. : 0,500] [Ind. aut. lankais: 0,321]. Čiegis, Raimondas; Starikovičius, Vadimas; Tumanova, Natalija; Ragulskis, Minvydas; Palivonaitė, Rita. Distributed parallel computing for visual cryptography algorithms // Proceedings of the second international workshop on Sustainable Ultrascale Computing Systems (NESUS 2015), Krakow, Poland, September 10-11, 2015 / editors: Jesus Carretero, Javier Garcia Blas Roman Wyrzykowski, Emmanuel Jeannot. Madrid: Computer Architecture, Communications, and Systems Group (ARCOS), 2015, ISBN 9788460825814. p. 23-28. [M.kr. : 09P; 01P]; [Ind. : 0,200] [Ind. aut. lankais: 0,086]. Pacevič, Ruslan [Pacevič, R.]; Kačeniauskas, Arnas [Kačeniauskas, A.]. Deployment of visualization software and GPU rendering on an OpenStack cloud infrastructure // Civil-Comp proceedings : proceedings of The fourth international conference on parallel, distributed, grid and cloud computing for engineering, Dubrovnik, Croatia 24-27 March, 2015. Vol. 107. Stirlingshire, UK: Civil-Comp Press, 2015. ISSN 1759-3433. p. [1-11]. [M.kr. : 07T]; [Ind. : 1,000] [Ind. aut. lankais: 0,786]. Kačeniauskas, Arnas [Kačeniauskas, A. ]; Pacevič, Ruslan [Pacevič, R.]; Staškūnienė, Miglė [Staškūnienė, M.]; Starikovičius, Vadimas [Starikovičius, V.]; Davidavičius, Giedrius [Davidavičius, G.]. Development of cloud software services for computational analysis of blood flows // Civil-Comp proceedings : proceedings of The fourth international conference on parallel, distributed, grid and cloud computing for engineering, Dubrovnik, Croatia 24-27 March, 2015. Vol. 107. Stirlingshire, UK: Civil-Comp Press, 2015. ISSN 1759-3433. p. [1-11]. [M.kr. : 07T; 09T]; [Ind. : 0,600] [Ind. aut. lankais: 0,471]. Čiegis, Raimondas; Starikovičius, Vadimas; Bugajev, Andrej. On parallelization of the OpenFOAM-Based solver for the heat transfer in electrical power cables // Euro-Par 2014: Parallel Processing Workshops Euro-Par 2014 International Workshops, Porto, Portugal, August 25-26, 2014, Revised Selected Papers, Part I. Lecture Notes in Computer Science. Switzerland : Springer, 2014. (Lecture Notes in Computer Science, vol. 8805, ISSN 0302-9743). ISSN 0302-9743. ISBN 9783319143248. 2014, vol. 8805, p. 1-11. [Duomenų bazės: SpringerLINK]; [M.kr. : 01P; 07T]; [Ind. : 0,333] [Ind. aut. lankais: 0,262]. Čiegis, Raimondas; Starikovičius, Vadimas; Bugajev, Andrej. On efficiency of the OpenFOAM-based parallel solver for the heat transfer in electrical power cables // Proceedings of the first international workshop on Sustainable Ultrascale Computing Systems (NESUS 2014), August 27-28, Porto, Portugal, 2014. Madrid : Computer Architecture,Communications, and Systems Group (ARCOS), 2014. ISBN 9788461722518. p. 43-46. [M.kr. : 01P; 07T]; [Ind. : 0,333] [Ind. aut. lankais: 0,095]. Iliev, O.; Lakdawala, Z.; Starikovičius, Vadimas. On a numerical subgrid upscaling algorithm for Stokes–Brinkman equations // Computers & mathematics with applications. Oxford : Elsevier Ltd. ISSN 0898-1221. Vol. 65, iss. 3 (2013), p. 435–448. [Duomenų bazės: Science Citation Index Expanded (Web of Science)]; [M.kr. : 01P; 07T]; [Citav. rod. : 2,069(F) (2012)]; [Ind. : 0,333] [Ind. aut. lankais: 0,333]. Pacevič, Ruslan; Markauskas, Darius; Radvilavičius, Lukas; Kačeniauskas, Arnas; Kutas, Remigijus. Cell attribute-based algorithm for crack visualization // Information technology and control. Kaunas : Technologija. ISSN 1392-124X. Vol. 42, no.3 (2013), p. 253-259. [Duomenų bazės: ISI Web of Science]; [M.kr. : 07T; 09T]; [Citav. rod. : 0,667(F) (2012)]; [Ind. : 0,400] [Ind. aut. lankais: 0,200]. Markauskas, Darius; Kačeniauskas, Arnas. Parallel computations of hopper discharge employing dynamic domain decomposition // Proceedings of theThird International Conference on Parallel, Distributed, Grid and Cloud Computing for Engineering (PARENG2013), Pécs, Hungary, 25-27 March, 2013. Stirlingshire : Civil-Comp Press, 2013. (Civil-Comp Proceedings, Vol. 101, ISSN 1759-3433). ISSN 1759-3433. ISBN 9781905088560. Vol. 101, p. [1-12]. [Duomenų bazės: Conference Proceedings Citation Index]; [M.kr. : 07T; 09T]; [Ind. : 0,500] [Ind. aut. lankais: 0,429]. Kačeniauskas, Arnas; Pacevič, Ruslan; Markauskas, Darius. 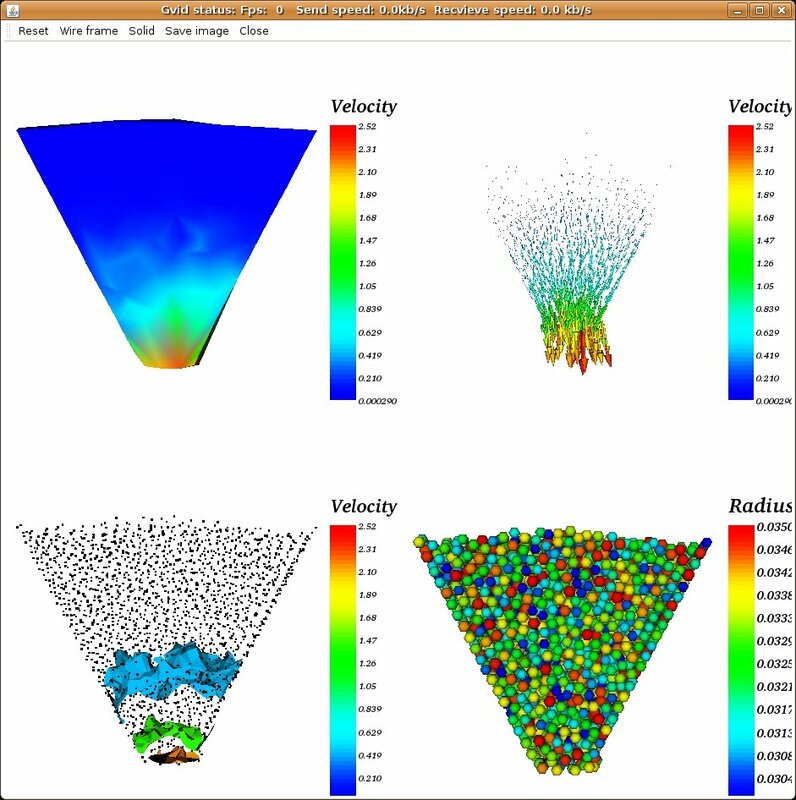 Analysis of crack geometry using distributed visualization software // Proceedings of theThird International Conference on Parallel, Distributed, Grid and Cloud Computing for Engineering (PARENG2013), Pécs, Hungary, 25-27 March, 2013. Stirlingshire : Civil-Comp Press, 2013. (Civil-Comp Proceedings, Vol. 101, ISSN 1759-3433). ISSN 1759-3433. ISBN 9781905088560. Vol. 101, p. [1-13]. [Duomenų bazės: Conference Proceedings Citation Index]; [M.kr. : 07T]; [Ind. : 0,666] [Ind. aut. lankais: 0,620]. Kačeniauskas, Arnas; Markauskas, Darius. Parallel computations of hopper discharge employing dynamic domain decomposition // Proceedings of theThird International Conference on Parallel, Distributed, Grid and Cloud Computing for Engineering (PARENG2013), Pécs, Hungary, 25-27 March, 2013. Kačeniauskas, Arnas; Pacevič, Ruslan; Markauskas, Darius. Analysis of crack geometry using distributed visualization software // Proceedings of theThird International Conference on Parallel, Distributed, Grid and Cloud Computing for Engineering (PARENG2013), Pécs, Hungary, 25-27 March, 2013. 1. Čiegis, Raimondas (redakt. ); Henty, David (redakt. ); Kågström, Bo (redakt. ); Žilinskas, Julius (redakt.). Parallel scientific computing and optimization: advances and application / Raimondas Čiegis, David Henty, Bo Kågström, Julius Žilinskas. New York: Springer, 2009. XXIV, 276 p. (Springer optimization and its applications, Vol. 27, 1931-6828). ISBN 9780387097060. Kačianauskas, Rimantas; Kačeniauskas, Arnas; Balevičius, Saulius; Stupak, Eugeniuš; Žurauskienė, Nerija; Novickij, Jurij. Numerical magneto-mechanical analysis of destructive coils with reinforcement cylinders of various thicknesses / R. Kačianauskas, A. Kačeniauskas, E. Stupak, N. Žurauskienė, S. Balevičius, J. Novickij // Acta Physica Polonica A. Warszawa : Polish Academy of Sciences. ISSN 0587-4246. Vol. 115, no. 6 (2009), p. 1144-1145. Prieiga per internetą: <http://przyrbwn.icm.edu.pl/APP/PDF/115/a115z662.pdf>. Tumonis, Liudas; Schneider, Markus; Kačianauskas, Rimantas; Kačeniauskas, Arnas. Comparison of dynamic behaviour of EMA-3 railgun under differently induced loadings / L. Tumonis, M. Schneider, R. Kačianauskas, A. Kačeniauskas // Mechanika. Kaunas : Technologija. ISSN 1392-1207. 2009, Nr. 4(78), p. 31-37. Tumonis, Liudas; Schneider, Markus; Kačianauskas, Rimantas [Kacianauskas, Rimantas]; Kačeniauskas, Arnas. Structural mechanics of railguns in the case of discrete supports / Liudas, Tumonis, Markus, Schneider, Rimantas, Kačianauskas, Arnas, Kačeniauskas // IEEE transactions on magnetics. Washington : IEEE. ISSN 0018-9464. Vol. 45 , iss. 1 (2009), p. 474-479. Čiegis, Raimondas. Numerical Solution of Hyperbolic Heat Conduction Equation / R. Čiegis // Mathematical modelling and analysis: the Baltic journal on mathematical applications, numerical analysis and differential equations. Vilnius : Technika. ISSN 1392-6292. Vol. 14, no. 1(2009), p. 11-24. Prieiga per internetą: <http://inga.vgtu.lt/~art/>. Čiegis, Raimondas; Laukaitytė, Inga; Radziunas, Mindaugas. Numerical algorithms for schrodinger equation with artificial boundary conditions / R. Čiegis, I. Laukaitytė, M. Radziunas // Numerical Functional Analysis and Optimization. Taylor & Francis INC: USA. ISSN 0163-0563. Vol. 30, Issue 9 & 10 (2009), p. 903-923. Prieiga per internetą: <http://pdfserve.informaworld.com/392088__918023382.pdf>. Kačeniauskas, Arnas [Kaceniauskas,A. ]; Kačianauskas, Rimantas [Kacianauskas, Rimantas]; Maknickas, Algirdas; Markauskas, Darius. Computation and visualization of poly-dispersed particle systems on gLite grid / A. Kačeniauskas, R. Kačianauskas, A. Maknickas, D. Markauskas // Proceedings of the First International Conference on Parallel, Distributed and Grid Computing for Engineering, held at Pollack Mihály Faculty of Engineering, University of Pécs, Hungary, 6-8 April 2009 Civil-Comp Ltd, Stirlingshire, United Kingdom. (Civil Comp Proceedings, iss. 90, 1759-3433). ISBN 9781905088287. 2009, p. 283-300. Starikovičius, Vadimas; Čiegis, Raimondas; Iliev, Oleg; Lakdawala, Zahra. A parallel solver for the 3D simulation of flows through oil filters / Vadimas Starikovičius, Raimondas Čiegis, Oleg Iliev and Zhara Lakdawala // Parallel scientific computing and optimization: advances and application. New York : Springer, 2009. (Springer optimization and its applications, Vol. 27, 1931-6828). ISBN 9780387097060. p. 181-191. Jakušev, Aleksandr; Čiegis, Raimondas; Laukaitytė, Inga; Trofimov, Vyacheslav. Parallelization of linear algebra algorithms using ParSol library of mathematical objects / Alexander Jakušev, Raimondas Čiegis, Inga Laukaitytė and Vyacheslav Trofimov // Parallel scientific computing and optimization: advances and application. New York : Springer, 2009. (Springer optimization and its applications, Vol. 27, 1931-6828). ISBN 9780387097060. p. 25-36. Čiegis, Raimondas; Gaspar, Francisko; Rodrigo, Carmen. Parallel multiblock multigrid algorithms for poroelastic models / Raimondas Čiegis, Francisco Gaspar and Carmen Rodrigo // Parallel scientific computing and optimization: advances and application. New York : Springer, 2009. (Springer optimization and its applications, Vol. 27, 1931-6828). ISBN 9780387097060. p. 169-180. Jankevičiūtė, Gerda; Čiegis, Raimondas. Parallel numerical solver for the simulation of the heat conduction in electrical cables / Gerda Jankevičiūtė and Raimondas Čiegis // Parallel scientific computing and optimization: advances and application. New York : Springer, 2009. (Springer optimization and its applications, Vol. 27, 19316828). ISBN 9780387097060. p. 207-214. Laukaitytė, Inga; Čiegis, Raimondas; Lichtner, Mark; Radziunas, Mindaugas. Parallel numerical algorithm for the traveling wave model / Inga Laukaityte, Raimondas Čiegis, Mark Lichtner and Mindaugas Radziunas // Parallel scientific computing and optimization: advances and application. New York : Springer, 2009. (Springer optimization and its applications, Vol. 27, 1931-6828). ISBN 9780387097060. p. 237-253. Kačeniauskas, Arnas; Pacevič, Ruslan; Katkevičius, Tomas; Bugajev, Andrej. Grid visualization e-service / Arnas Kačeniauskas, Ruslan Pacevič, Tomas Katkevičius and Andrej Bugajev // Proceedings of NDTCS'09: 13th international workshop on New Approaches to High-Tech: Nano-Design, Technology, Computer Simulations. 2226 June 2009, Vilnius, Lithuania. Vol. 13 / Institute of Theoretical Physics and Astronomy of Vilnius University (Lithuania), St. Petersburg Academy of Sciences for Strength Problems (Russia) Vilnius : ITPA of Vilnius University. p. 92-98. Kačeniauskas, Arnas; Pacevič, Ruslan; Katkevičius, Tomas. Dam break flow simulation on grid / Arnas Kačeniauskas, Ruslan Pacevič, Tomas Katkevičius // Proceedings of NDTCS'09: 13th international workshop on New Approaches to High-Tech: Nano-Design, Technology, Computer Simulations. 22-26 June 2009, Vilnius, Lithuania. Vol. 13 / Institute of Theoretical Physics and Astronomy of Vilnius University (Lithuania), St. Petersburg Academy of Sciences for Strength Problems (Russia) Vilnius : ITPA of Vilnius University. p. 85-91. Kačeniauskas, Arnas [Kaceniauskas,A. ]; Kačianauskas, Rimantas [Kacianauskas, Rimantas]; Maknickas, Algirdas; Markauskas, Darius. Computation and visualization of poly-dispersed particle systems on gLite grid / A. Kačeniauskas, R. Kačianauskas, A. Maknickas, D. Markauskas // Proceedings of the First International Conference on Parallel, Distributed and Grid Computing for Engineering held at Pollack Mihály Faculty of Engineering, University of Pécs, Hungary, 6-8 April 2009 : [abstracts] / Civil-Comp Proceedings:90. Civil-Comp Ltd, Stirlingshire, United Kingdom. ISBN 9781905088270. 2009, p. 100. Kačeniauskas, Arnas. Development of efficient interface sharpening procedure for viscous incompressible flows // Informatica. ISSN 0868-4952. Vol. 19, no. 4 (2008). p. 487-504. Prieiga per internetą: <http://www.mii.lt/informatica/>. Kačianauskas, Rimantas; Kačeniauskas, Arnas; Stupak, Eugeniuš; Balevičius, Saulius; Žurauskienė, Nerija; Novickij, Jurij. Failure analysis of destructive coils // Journal of vibroengineering. ISSN 1392-8716. Vol. 10, iss. 2 (2008). p. 165-169. Prieiga per internetą: <http://www.fondai.com/Vibro/JVE.htm>. Kačeniauskas, Arnas. Mass conservation issues of moving interface flows modelled by the interface capturing approach // Mechanika. ISSN 1392-1207. 2008, Nr. 1(69). p. 35-41. Prieiga per internetą: <http://www.ktu.lt/lt/mokslas/zurnalai/meniu.asp>. Maknickas, Algirdas; Kačianauskas, Rimantas; Kutas, Remigijus. Simulation of solid specimen for compression tests by discrete particles // Mechanika. ISSN 1392-1207. 2008, Nr. 4(72). p. 5-13. Prieiga per internetą: <http://www.ktu.lt/lt/mokslas/zurnalai/meniu.asp>. Čiegis, Raimondas; Dement'ev, Aleksandr; Laukaitytė, Inga. A numerical algorithm for simulation of the Qswitched fiber laser using the travelling wave model // Lithuanian mathematical journal. ISSN 0363-1672. Vol. 48, no. 3 (2008). p. 270-281. Prieiga per internetą: <http://www.springer.com>. Laukaitytė, Inga; Čiegis, Raimondas. Finite-difference scheme for one problem of nonlinear optics // Mathematical modelling and analysis: the Baltic journal on mathematical applications, numerical analysis and differential equations. ISSN 1392-6292. Vol. 13, no. 2 (2008). p. 211–222. Prieiga per internetą; <http://senas.vgtu.lt/rc/mma>. Čiegis, Raimondas; Radziunas, M; Lichtner, M. Numerical algorithms for simulation of multisection lasers by using traveling wave model // Mathematical modelling and analysis: the Baltic journal on mathematical applications, numerical analysis and differential equations. ISSN 1392-6292. Vol. 13, no. 3 (2008). p. 327–348. Prieiga per internetą: <http://senas.vgtu.lt/rc/mma>. Čiegis, Raimondas; Dement'ev, Aleksandr; Jankevičiūtė, Gerda. Numerical analysis of the hyperbolic twotemperature model // Lithuanian mathematical journal. ISSN 0363-1672. Vol. 48, no 1 (2008). p. 46-60. Prieiga per internetą: <http://www.springer.com>. Čiegis, Raimondas; Čiegis, Remigijus; Meilūnas, Mečislavas; Jankevičiūtė, Gerda; Starikovičius, Vadimas. Parallel numerical algorithms for optimization of electrical cables // Mathematical modelling and analysis: the Baltic journal on mathematical applications, numerical analysis and differential equations. ISSN 1392-6292. Vol. 13, no. 4(2008). p. 471–482. Prieiga per internetą: <http://senas.vgtu.lt/rc/mma>. Čiegis, Raimondas; Gaspar, F.J; Rodrigo, C. On the parallel multiblock geometric multigrid algorithm // Computational methods in applied mathematics. ISSN 1609-4840. Vol. 8, no 3 (2008). p. 223-236. Prieiga per internetą: <http://www.cmam.info/>. Čiegis, Remigijus; Čiegis, Raimondas. Laws of thermodynamics and sustainability of the economy // Inžinerinė ekonomika = Engineering economics. ISSN 1392-2785. 2008, Nr. 2(57). p. 15-22. Prieiga per internetą: <http://www.ktu.lt/lt/mokslas/zurnalai/inzeko/inzek048.asp>. 1. Tumonis, Liudas; Schneider, M.; Kačianauskas, Rimantas; Kačeniauskas, Arnas. Structural mechanics of railguns in the case of discrete supports // 14th Symposium on Electromagnetic Launch Technology Victoria, BC, Canada, 10-13 June 2008 [elektroninis išteklius] / The World's Leading Professional Association for the Advancement of Technology. New York : IEEE, 2008. ISBN 978-1-4244-1832-9. p. [1-6]. Prieiga per internetą: <http://www.ieee.org/>. Dedering, Michael; Stausberg, Wolfgang; Iliev, Oleg; Lakdawala, Zahra; Čiegis, Raimondas; Starikovičius, Vadimas. On new challenges for CFD simulation in filtration // WFC 10. Discover the future of filtration & separation : 10th world filtration congress. April 14-18, 2008, Leipzig, Germany : congress proceedings / VDI Society for Chemical and Process Engineering GVC. Vol. I - L-Sessions. Leipzig, 2008. p. 316-320. Prieiga per internetą: <http://www.wfc10.com>. Kačianauskas, Rimantas ; Kačeniauskas, Arnas ; Stupak, Eugeniuš ; Balevičius, Saulius ; Žurauskienė, Nerija ; Novickij, Jurij. Numerical magneto-mechanical analysis of destructive coils with reinforcement cylinders having various thicknesses // 2nd Euro-Asian pulsed power conference (EAPPC2008). 4th European pulsed power symposium. 7th International symposium on pulsed power and plasma applications. 5th Symposium on pulsed power applications. IET pulsed power symposium 2008 [elektroninis išteklius] : proceedings. 22-26 September 2008 Vilnius, Lithuania [CD] / International Society on Pulsed Power Applications, Semiconductor Physics Institute, French-German Research Institute Saint-Louis, The Institution o Engineering and Technology, Vilnius Gediminas Technical University. Vilnius, 2008. p. [1-4]. Prieiga per internetą: <http://www.pulsed-power.org/>. Tumonis, Liudas; Kačianauskas, Rimantas; Kačeniauskas, Arnas. Evaluation of friction due to deformed behaviour of rail in the electromagnetic railgun: numerical investigation // Mechanika. ISSN 1392-1207. 2007, Nr.1(63). p. 5863. Prieiga per internetą: <http://www.ktu.lt/lt/mokslas/zurnalai/meniu.asp>. Tumonis, Liudas; Kačianauskas, Rimantas; Kačeniauskas, Arnas; Schneider, Marcus. The transient behavior of rails used in electromagnetic railguns: numerical investigations at constant loading velocities // Journal of vibroengineering. ISSN 1392-8716. Vol. 9, no. 3 (2007). p. 15-18. Prieiga per internetą:<http://www.fondai.com/Vibro/JVE.htm>. 1. Čiegis, Raimondas; Baravykaitė, Milda Marija. Implementation of a black-box global optimization algorithm with a parallel branch and bound template // Applied parallel computing. State of the art in scientific computing. 8th international workshop, PARA 2006, Umeå, Sweden, June 18-21, 2006: revised selected papers. Lecture Notes in Computer Science. ISSN 0302-9743. Vol. 4699 (2007). p. 1115-1125. Prieiga per internetą: <http://www.springerlink.com/lncs>. Belovas, Igoris; Starikovičius, Vadimas. Parallelization of the α-stable modelling algorithms // Mathematical modelling and analysis: The Baltic journal on mathematical applications, numerical analysis and differential equations. ISSN 1392-6292. Vol. 12, no. 4 (2007). p. 409-418. Prieiga per internetą: <http://senas.vgtu.lt/rc/mma>. Baravykaitė, Milda Marija; Čiegis, Raimondas. An implementation of a parallel generalized branch and bound template // Mathematical modelling and analysis: the Baltic journal on mathematical applications, numerical analysis and differential equations. ISSN 1392-6292. Vol. 12, no. 3 (2007). p. 277-289. Prieiga per internetą: <http://senas.vgtu.lt/rc/mma>. Čiegis, Raimondas; Ilgevičius, Audrius; Liess, H.; Meilūnas, Mečislavas; Suboč, Olga. Numerical simulation of the heat conduction in electrical cables // Mathematical modelling and analysis: The Baltic Journal on Mathematical Applications, Numerical Analysis and Differential Equations. ISSN 1392-6292. Vol. 12, no. 4 (2007). p. 425-440. Prieiga per internetą: <http://senas.vgtu.lt/rc/mma>. Čiegis, Raimondas; Čiegis, Remigijus; Jakušev, Aleksandr; Šaltenienė, Gailė Kamilė. Parallel variational iterative linear solvers // Mathematical modelling and analysis: the Baltic journal on mathematical applications, numerical analysis and differential equations. ISSN 1392-6292. Vol. 12, no. 1 (2007). p. 1-16. Prieiga per internetą: <http://senas.vgtu.lt/rc/mma>. Kačeniauskas, Arnas; Mažeika, Dalius. Lietuvos lygiagrečiųjų ir paskirstytųjų skaičiavimų tinklo LitGRID pristatymas // Mokslas ir technika : Lietuvos MA ir Lietuvos inžinierių sąjungos mėnesinis žurnalas. ISSN 0134-3165. 2007, Nr.2. p. 40-41. Prieiga per internetą: <http://neris.mii.lt/mt>. Čiegis, Raimondas. Matematinis modeliavimas ir analizė // Gedimino universitetas. ISSN 1392-5857. 2007, Nr. 3. p.13. Prieiga per internetą: <http://senas.vgtu.lt/leidiniai>. Programme EUREKA, project “Optimization of the cable harness”. Supervisor: R. Čiegis. Project duration: 2006-2009. Global optimization of complex systems using high performance computing and GRID technology. Supervisor: R. Čiegis. Project duration: 2007-2009. Grid technology has changed the approach and understanding of application and usage of computers and computing technologies. Moreover grid technologies make it possible to create a unigue type of e-services, which are utterly inefficient or impossible in other types of environment. However it is necessary to carry out suitable research in order to find out a convenient interface for applied computing, for e-services, for results presentation. In this project, grid visualization e-Service VizLitG is developed. VizLitG is designed for convenient access and interactive visualization of remote data files located in grid. Open source grid visualization e-Service VizLitG is designed for convenient access and interactive visualization of remote data files located in grid. VizLitG is employed for visualization of scientific results computed on Lithuanian grid (LitGrid). VizLitG is build by Java and GlassFish. The message authentication over SSL mechanism is employed for security reasons. VizLitG includes automatic HDF5 data management and VTK visualization engine. Moreover, transfer of interactively selected parts of datasets located in experimental Storage Element has been implemented. 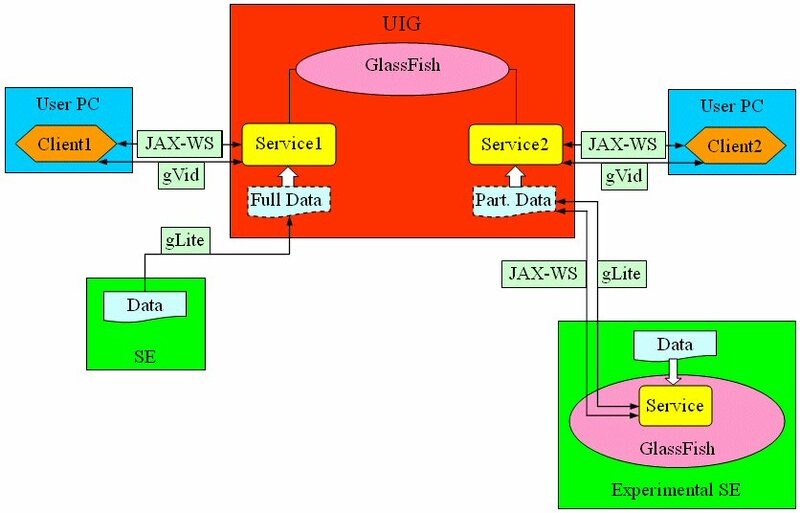 Remote instrumentation provided by Java EE and GlassFish. HDF5 data management and interactive data selection based on GUI. Interactive construction of visualization network (described by XML). Visualization engine is based on VTK toolkit. Visualizations can be grouped in several viewports. Full interactivity including VTK widgets is provided by GVid. Full file transfer from SE by means of LFC (LCG) and GridFTP. Visualization of interactively selected parts of datasets transferred from experimental SE by using JAX-WS. The client-server architecture of VizLitG is based on widely recognized web standards. The e-service is implemented in GlassFish application server. 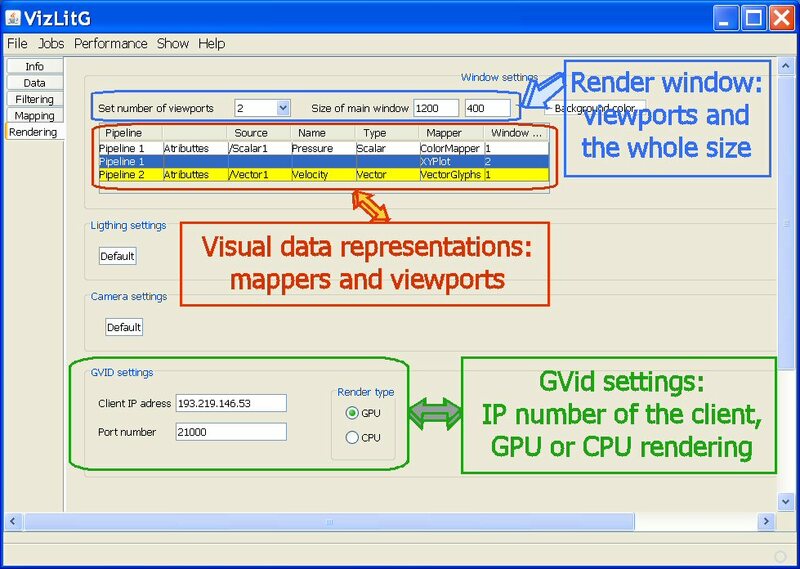 The visualization server runs on special User Interface for Graphics (UIG). Thus, natural access to grid resources is available. The light-weighted client is implemented as Java application. Data files located in SE can be accessed by using traditional means like LFC (LCG). The additional application server runs on the experimental SE in order to provide special data services able processing and transferring the selected parts of datasets. In order to provide for remote users high interactivity level, GVid software was implemented in VizLitG as video-streaming module. The most importand GVid classes were renewed to support VTK 5.4. The compressed video stream is efficiently transferred through the network and displayed on the client by the Viewer. VTK interactor styles are available for users as well as VTK widgets. Thus, remote user has full interactivity provided by VTK based application. GUI allows automatic data management and interactive dataset selection. In order to process HDF5 files automatically, datasets are stored in predefined structure allowing the software to interpret the structure and contents of a file without any outside information. HDF5 groups and datasets are automatically processed considering values of HDF5 attributes. Time dependent and time independent data are processed differently. 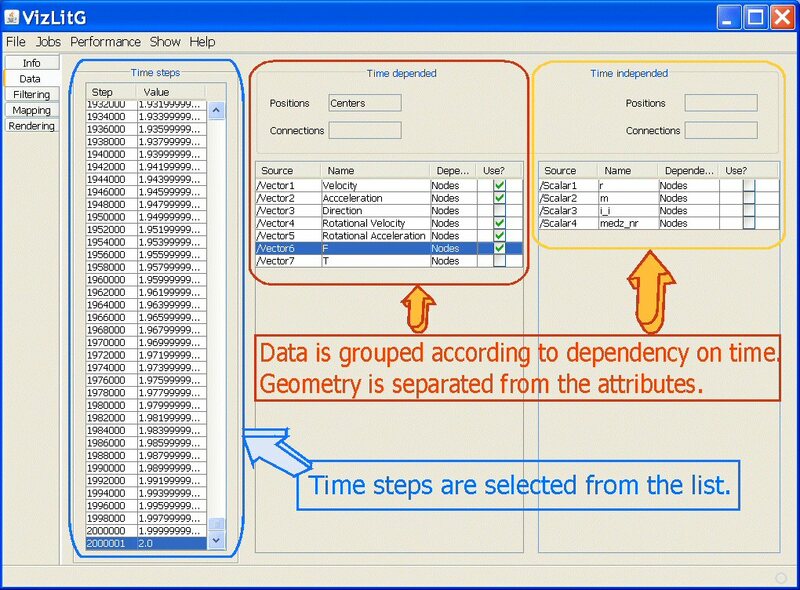 Datasets that do not change in time are located in the group Common. Datasets varying in time are grouped and stored according to time step number. GUI separates geometry and topology from attributes like scalars or vectors in order to emphasize their different nature. The visualization engine of the VizLitG is based on VTK toolkit. VTK objects are enwrapped by Java programming language in order to build the service. A visualization network is assembled from VTK objects by using GUI. The resulting pipelines are described by XML language. Valid XML documents are automatically generated on a client and transferred to the server by JAX-WS. Tabular design of GUI fields simply illustrates the dataflow. In the filtering window, the attention is focused on the dataset changes in order to provide information for users about ongoing work of filters involved. The window consists of three areas: a visualization network constructed from several branches, parameters of the selected filter and current dataset of the selected pipeline. In the upper part of the window, each pipeline is shown in the separate line. The parameters of the selected filter are entered in corresponding fields of the middle part of the filtering window. The lower part of the filtering window is designed for displaying the current data of the selected pipeline. Different data is colored by different colors. User can see sources, actual names and types of the attributes. The last column shows how attributes are used. The mapping window consists of three areas. The upper area shows a visualization network. User selects pipeline in order to see data information, which is displayed in the middle part of the window. Each line in the provided table shows attribute, which can be mapped to the geometric representation in the desired form. User selects desired attribute, chooses available mapper from the combo box and presses the button Add. The necessary parameters of the selected mapper are shown in corresponding fields of the lower part of the mapping window. Multiple VTK renderers can work in one render window, therefore, complex visualizations can be grouped in several viewports (up to 4). The figure illustrates rendering window. User specifies the Size of main window. Each renderer renders to its own viewport. If user desires to see created visual representations in separate viewports, he can Set number of view ports. Each line of created visual representation (scalar field, vector field, geometry or topology) should be bound to windows number. Very important GVID settings are defined in the lower part of rendering window. Client IP address defines location of the client PC. Port number is very important for socket connection. Cuts and clips geometry (vtkCutter, vtkClipDataSet, vtkProbeFilter). Visualization of positions (vtkGlyph3D, vtkGlyph2D, vtkIdFilter, vtkLabeledDataMapper). Visualization of streamlines (vtkStreamTracer, vtkTubes, vtkGlyph3D, vtkGlyph2D).